2 x Mosquito Coil Holders/Incense Coil Holders (box contains 2 coil holders). Do you throw out broken pieces of mosquito/incense coils? Not any more, this unique and simple invention holds the coils / broken pieces of coil upright or laid on their side. Not only does it look good but you are saving money by using up any broken pieces of coil. This patented design is so simple, just squeeze to open and place the full coil or a broken piece of coil between the stainless steel arms. Box contains two (2) mosquito coil holders. ONLY BUY ONCE - these stainless steel holders will not break or rust - no need to replace next year, or the next, or the next. Also available as a box of 4 for 29.45. To view type "Crochead" in the Search Bar. Don't waste those broken pieces of coil. Holds complete and broken mosquito / incense coils - no more wastage when the coil breaks. More savings! Only burn part of a coil by placing the coil holder anywhere on the full coil - it will only burn to that point and then go out. Our unique coil holders are carefully hand made in Australia from stainless steel - will never rust or break. Patent Protected design (US 8 146 876 / CA 269 4662 / AU 2007216907). 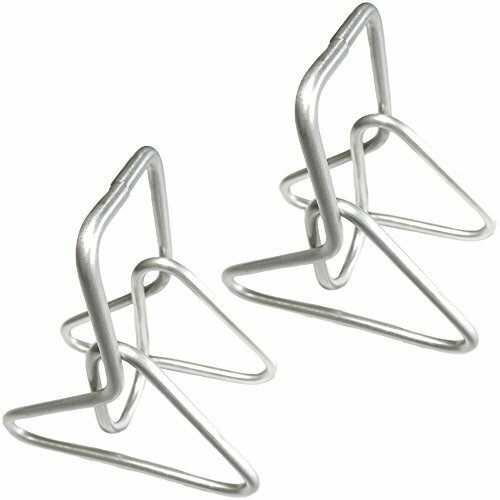 Coil holders can be used in a variety of positions - stand the holder vertically, lay it on its side or hang it. Looks great placed on a colourful dish to catch the ashes. If you have any questions about this product by Crochead, contact us by completing and submitting the form below. If you are looking for a specif part number, please include it with your message. 4 x Mosquito Coil Holders/Incense Coil Holders (box contains 4 coil holders).